We are a dedicated group of parents, staff and community members focused on supporting Meiners Oaks School programs, with the goal of building future citizens of the world. Our meeting times can be found on the Meiners Oaks Event Calendar. We welcome parent participation in our meetings and throughout the year at our various events. Please join us and thank you for your support! 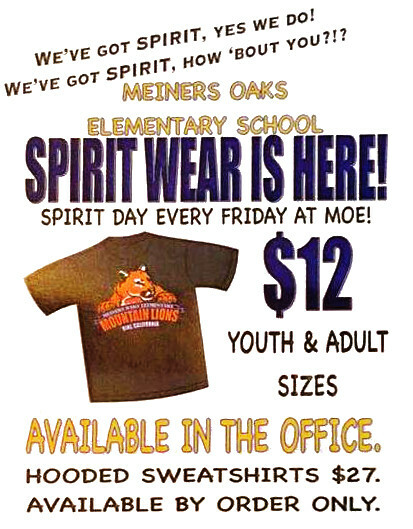 By registering your credit cards and gas cards with eScrip you earn money for Meiners Oaks Elementary every time you shop. It’s free and simple to join. Click on “Register Your Card” or “Renew” and follow the prompts. Congratulations to Mrs. Duncan’s class for raising the most money—$447.75- during our Penny Drive! Thank you to all the students for pitching in and raising enough money to purchase and install not one, but two, Hydration Stations on our campus. Mountain Lion Pride!